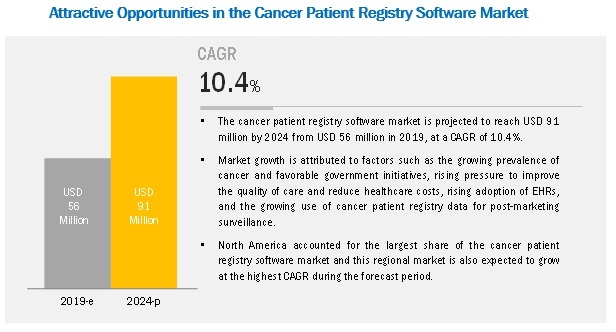 [124 Pages Report] The cancer patient registry software market is projected to reach USD 91 million by 2024 from USD 56 million in 2019, at a CAGR of 10.4% during the forecast period. 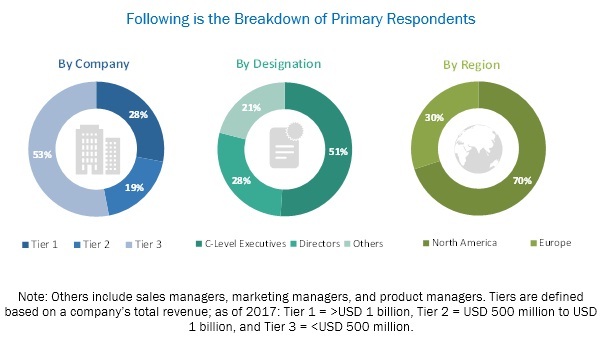 Factors such as the increasing prevalence of cancer, favorable government initiatives, rising pressure to improve the quality of care and reduce healthcare costs, rising adoption of EHRs, and the growing use of cancer patient registry data for post-marketing surveillance are driving the growth of this market. However, factors such as privacy and data security-related concerns are expected to restrain the growth of this market to a certain extent. Based on type, the cancer patient registry software market is segmented into standalone and integrated software. The standalone software segment accounted for a larger share in 2018 primarily due to the significant use of standalone software by government organizations & TPAs for population health management (due to its adaptability and interoperability). Also, standalone software provides practical and easy-to-use tools to store and process registry data, while standalone software customized for patient registries offers higher flexibility and features such as multiple system usage and automatic upgradation. Based on end user, the cancer patient registry software market is segmented into private payers; hospitals & medical practices; research centers; pharmaceutical, biotechnology, & medical device companies; and government organizations & third-party administrators. The research centers segment is estimated to grow at the highest CAGR during the forecast period. Research centers use cancer patient registry software primarily to track patients who are eligible for clinical trials and product development. In 2018, North America accounted for the largest share of the cancer patient registry software market. This regional market is also estimated to grow at a higher CAGR during the forecast period. This can be attributed to the high burden of cancer, government funding initiatives to encourage the development of cancer registries, high investments in healthcare IT, presence of major cancer registry software-developing players, and the high adoption rate of these solutions in the region. The cancer patient registry software market is highly consolidated in nature with a limited number of players operating in it. Prominent players in this market include Elekta (Sweden), Electronic Registry Systems, Inc. (US), Onco, Inc. (US), C/NET Solutions (US), Rocky Mountain Cancer Data Systems (US), and McKesson Corporation (US). Elekta is one of the leading providers of clinical software and equipment for cancer care and brain disorders. Elekta’s key expertise lies in precision radiation medicine. The company provides cost-effective and high-quality cancer care services and software to its customers. It offers cancer patient registry software through its Oncology Informatics segment. Elekta’s cancer registry software is designed with a highly detailed database that helps end users to gain insights into overall patient outcomes. Electronic Registry Systems (ERS) is another leading player in the cancer patient registry software market. The cancer registry software solution provided by the company helps in recording and reporting important cancer patient information. Moreover, the company’s cloud-based CRStar technology helps in curtailing ongoing costs and minimizes start-up time for hospitals and healthcare facilities. The company caters to various healthcare institutes throughout the US and internationally. In April 2017, McKesson Corporation acquired CoverMyMeds (US) to enhance its technology offerings for clinicians, payers, and pharmaceutical manufacturers. In April 2016, McKesson Corporation announced the acquisition of Vantage Oncology, LLC to expand its oncology portfolio. What are the factors driving the growth of this market? What are the recent collaborations key players have entered into? What are the recent trends affecting cancer patient registry software manufacturers? This study involved four major activities to estimate the current size of the cancer patient registry software market. Information on the market and its peer & parent markets was collected through exhaustive secondary research. The next step was to validate these findings, assumptions, and sizing with industry experts across the value chain through primary research. Both top-down and bottom-up approaches were employed to estimate the complete market size. Thereafter, market breakdown and data triangulation were used to estimate the size of segments and subsegments. Secondary research was mainly used to identify and collect information for the extensive, technical, market-oriented, and commercial study of the cancer patient registry software market. Secondary sources such as directories; databases such as Bloomberg Business, Factiva, and Wall Street Journal; white papers; and annual reports were used to obtain key information about major players, market classification, and segmentation according to industry trends, regional/country-level markets, market developments, and technology perspectives. In-depth interviews were conducted with various primary respondents, including key industry participants, subject-matter experts (SMEs), C-level executives of key market players, and industry consultants, among other experts, to obtain and verify the critical qualitative and quantitative information as well as assess future prospects of the market. Various primary sources from both the supply and demand sides of the market were interviewed to obtain qualitative and quantitative information. Revenue generated by leading players through cancer patient registry software has been determined through primary and secondary research.